Adventure to the heart of Pengotan village, Bangli regency (part 2) – "da Trooper Bali"
Hi all of my beloved da Trooper Indonesia friends. How are you today…? Hope every things are well with you. I am back again to continue the story of the adventure to the heart of Pengotan village in Bangli regency. But, the day after, some friends call me and propose to delay the journey until the next week or on 20 May 2012 as he and family really want to join, but have some works that cannot wait to do this week. I than once again invite them and make sure if they really wants to join and asked to list how many person will join as Pak Ketut wants to know how many person will join in order to enable prepare a meals for coffee break and the lunch, to avoid the problem of the meals less or too much. Once again then I call Pak Ketut and explain the situation and ask his approval to reschedule the tour and luckily he approved with pleasant. And now the time to prepare our vehicle and ourselves too. Pengotan village is one of the ancient old original Balinese village call “Bali Aga”. The village placed very closed with Kintamani and still in the same area with popular active volcanic mountain in Bali, Mount Batur. The situation is about 900 to 1100 meters above the sea level, hence make the weather pretty cold nice which is about 23 to 26 degrees in the day time and will significantly drop till 16 to 19 degrees at the night and will make a wet of the grass and the trees trunk when the morning has broken. It is not difficult to find the village, it’s only driving for about 1 to 2 hours to reaches. There is two route we can choice. The first route is the regular route thru the east side of Gianyar City. While the other route is thru the famous art village thru Ubud where we stop over to buy some things of the handycraft. Pengotan village population with about 700 people with most of them are a farmer. They planting cabbage, tangerine, carrot, sweet potatos, green bean and some of other plantation. Pengotan village pretty good to visit especially for the people who love to learn the traditional original Balinese culture. Pengotan people are originate Balinese. Meaning, they are not came from Java during the Majapahit Royal Kingdom. They are pure Balinese. Pengotan village a holy priest leader who assign because she or he has a special power and knowledge about the supra natural where the people belief their leader will help to communicate with their gods and goddess in order to keep them secure and give them all the things needed in their life. Their leader is really a special wise person and has a good talent to get in touch with the god and goddess who can arrange the structure of principle of life for the people of Pengotan village to keep their village safely. Okay, that is the story of the Pengotan village. Now back to our journey. After fixing the plan and arrange all the things, I send short message to all friends who wants to join and ask their commitment not to cancel or inform me in advance if there is any changes of the members. And yes on 11 May 2012 I records that there is 6 Trooper, 1 Chevy Luv 4 X 4 and 2 land Rover Series long on the list, with about 23 pax including 17 adults and 6 children. Me with my Black Trooper DK 999 YQ powered by 4ZD1 standard, still wearing old tire R15/7.5″ Rim with Achilles Desert Hawk in 60% condition occupying by my self as a navigator, Andhika as pilot, my wife Ditta in the center raw seat. An then Pak Komang Artayasa with his Blue LWB Trooper 3 doors powered by 4JB1T powerful engine acompanying by his brother and his 2 children, Yande Suartika with his Hi Roof Black Trooper with license DK 777 CL powered by 4ZD1 standard using 15R with 30” tire BS/MT in good condition above then 80% condition, Gusti Made Rumpika with his Grey LWB 5 doors powered by C223 standard wearing R15 BS A/T new tire let say still 95% because change a few before bring all of his family, wife and 3 children, Putu Andy with his Landy long with gasoline engine standard bring his family, wife and 3 children also 1 adult of his relative and Pak Agung a friend of Putu Andy with hard Top 79 with engine swap to diesel from Toyota Dyna accompanying by his relative. While 3 members, Bli Gde Roda, Pak Murya and Pak Ketut Uban could not join because they have work which could not wait to do. 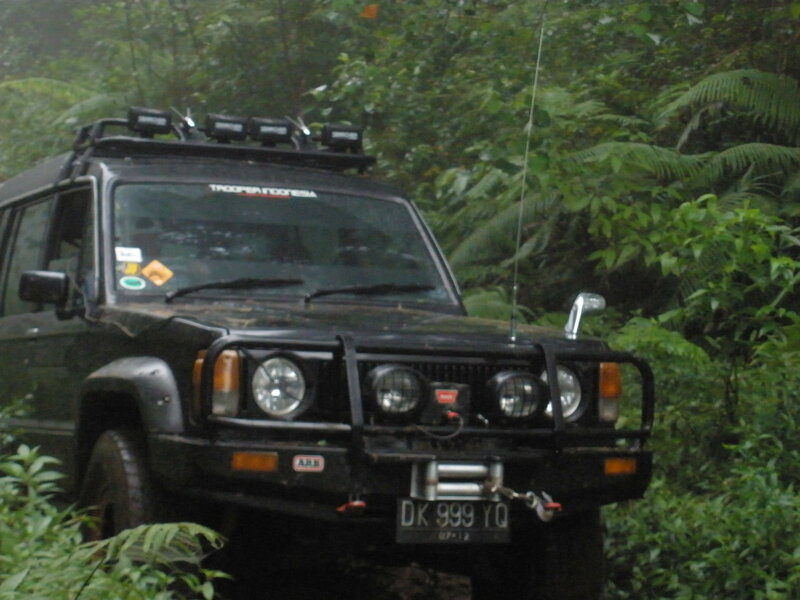 So there will be 6 vehicle going to join adventure to Pengotan village Bangli regency this morning. As discuss earlier, the meeting point is in gasoline station in Jl. Cok Agung Tresna, nearby the TVRI Bali station and we prepare to be there by 7.30 WITA. While I and my wife stay in my “kampong village” since last night has get up by 5.30 am WITA as we must do an offering to our family temple in our forefather house before leaving to Denpasar. I get up early in the morning and get a shower after my wife finish and get ready at 6.00 WITA. I have prepare my Black Trooper since yesterday noon and checked the engine bay to make sure everythings are alright. Check the water coolant, the deep stick engine oil, liquid of the battery and seem every things are OK. I start the engine and let it warming up in it’s garage while I preparing the logistic to carry on for the trip. By 6.05 WITA we leave my home village and moving to our forefather house nearby to praying as today is the holly day for Hindu. Just take about 20 minutes, we than move on to Denpasar. From my kampong in Sam Sam village in Tabanan regency take time about 45 minutes if no traffic jam. My kampong placed in main road of Denpasar – Gilimanuk which is the only road to and from Denpasar to Java. I quiet afraid that the road will crowded and traffic jam by the trucks full loaded which usually will cause move very slow and makes the traffic jam on this road. It is often happen especially a long on the road nearby my village. By 6.30 WITA. I ‘ve been in Jalan By Pass Kediri – Pesiapan and facing a traffic jam because of there is a big truck loaded a heavy items move very slowly and causing the other vehicle must quieting on it’s back including me. I try to passing but, from the opposite there is big bus also want to passing the other vehicle and make me must get back and quieting again. It’s really really stagg finally as the trucks in front of me seem facing a problem with the loaded as it seem it is over loaded and it move become more slowly now because of the inclining road. Suddenly my mobile rang, but for short message sign. I pick up the hand set and watching the display and it was from Andhika, stating that he is on the way to Renon. I still driving in a normal cruise when the mobile ringing again. I pick up the hand set and it was from Pak Komang Arthayasa asking where is the meeting point, as there is no body in Gasoline Station that we mention earlier. I just inform that it could be most of the friends still on the way and suggest to waiting for a while, and inform that I am also on the way and take about another 10 minutes to arrive there. 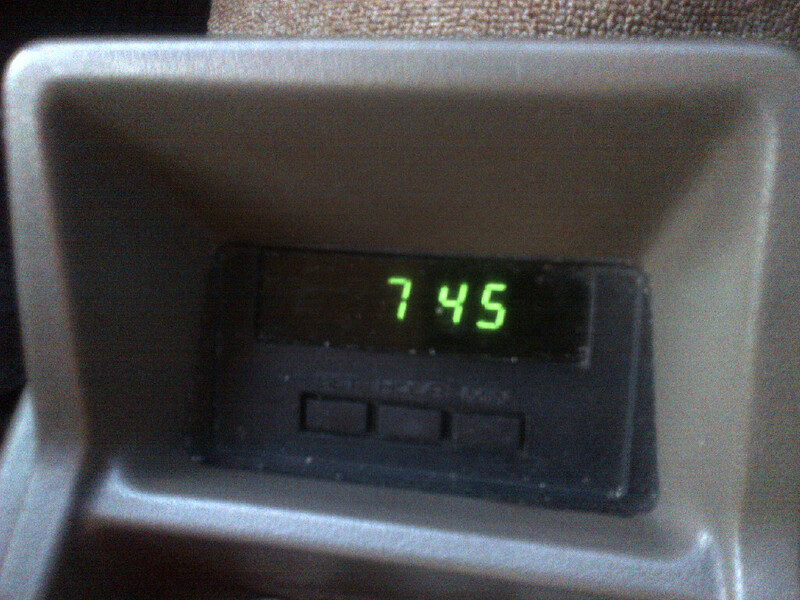 I flash look at the digital clock in console box which is already been shown 7.45 WITA while we still in Tabanan regency and need another 18 kilometers to ward to reach Jalan Cok Agung Tresna in Renon, Denpasar. Just after facing the traffic light in Kediri to Tanah Lot, I can passing the truck and could push the pedal more fast. Luckily in Kapal village and in Beringkit traditional market the road not really crowded as usual, so I can driving more faster to catch the time to be arrive in Renon in time. Suddenly my mobile ringing gain and it was from Yande Suartika asking where is the meeting point exactly as he felt he was late. On that time I already been in Jalan Cok Agung Tresna about a few seconds from the meeting points. Pak Putu Andy also call me informing that he start slowly ahead as need to buy some foods for the children in the near mart in front.He joining by Pak Agung with his Red Maroon FJ 40. By 8.27 WITA I arrive at the meeting point and drop to the gasoline station to fill the fuel tank fully. And Yande follow me to fill the fuel tank. Upon fully the fuel tank, I ask my wife to line up with the friends who already waiting while I need to visit a rest room.It seem there is Pak Komang Artayasa Trooper, Pak Rumpika already been park there. please visit this web as the story will continue…. This entry was posted in Adventures, Feature, Trips and tagged Adventure, Baliaga, Bangli, goddes, gods, Original, Pengotan, Pure. Bookmark the permalink.